Formed in 1968, The Last Poets are heralded as the godfathers of hip hop alongside the likes of Gil Scott-Heron. The Poets’ music was part of a wave of politically resonant, culturally influential music released by African American musicians including Marvin Gaye, Funkadelic, Curtis Mayfield and Quincy Jones, and they eventually inspired hip hop giants like Dead Prez, Common, Public Enemy and Kanye West. Transcending Toxic Times features original The Last Poets members Abiodun Oyewole and Umar Bin Hassan alongside longtime percussionist Baba Donn Babatunde and bassist/producer Jamaaladeen Tacuma. Other poets on the album include Ursula Rucker, Wadud Ahmad, and Malik B (a founding member of The Roots). 50 years ago, Abiodun Oyewole was mourning the deaths of Malcolm and Martin among many others lost in the struggle of the time. 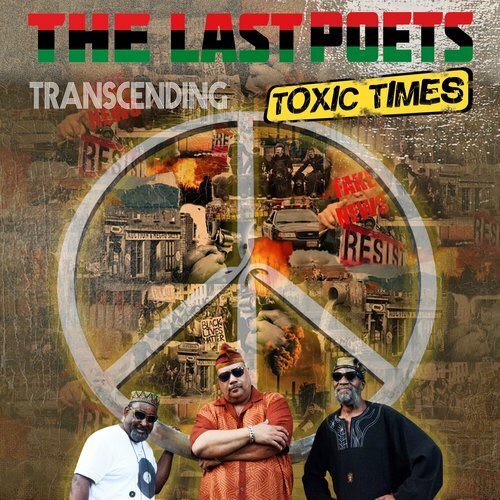 Looking to speak truth and challenge the thinking of both the oppressors and the oppressed, he formed The Last Poets. Soon after the group’s inception, Oyewole met Umar Bin Hassan at a black arts event in Ohio, and Umar made the trip to New York to join them. Baba Donn Babatunde showed up later, adding percussion to their poetry. The three men have persevered through decades of personal and political challenges, while still adhering to the higher principles of love, respect, and kindness to all humankind. Enter Jamaaladeen Tacuma: in addition to playing bass on Transcending Toxic Times, it’s his role as producer that elevates this album above all others. Tacuma innately understands The Last Poets’ message and how it must be delivered. It is not poetry set to music, nor is it music made for poets: it’s a seamless transfiguration of groove and language and the essential power that can result in the combination of the two.